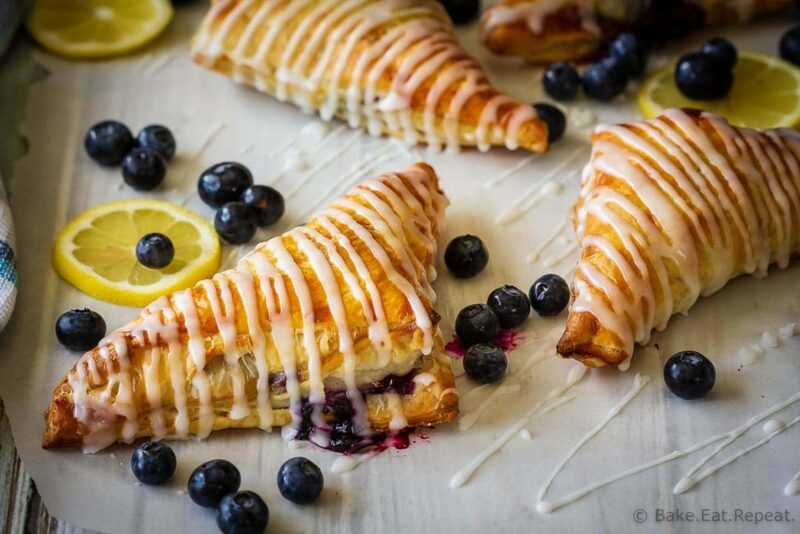 These lemon blueberry turnovers are a fast and easy dessert that everyone will love – the perfect sweet treat for the summer! Anyone looking for a quick and easy dessert that is perfect for the summer months? Pie without the effort of making pie? Because that’s basically what turnovers are, right? They’re like cute little hand pies, but without having to make pastry and roll it out and everything. Although, these would be good with homemade pastry instead of store-bought puff pastry too – but I went with quick and easy this time. Plus, puff pastry is just really fantastic – and as of yet I haven’t tried making it from scratch. It’s one of those things that I definitely want to try sometime, but I kind of feel like it won’t be worth the effort. It seems like a lot of work and time to make it and, well, the box from the store is pretty good, so I’m not sure the time spent to make it would be worthwhile! This lemon and blueberry filling would be good with regular pastry too though, made into hand pies kind of like these berry pop tarts. But I went with puff pastry for the classic, puffy turnover with layers and layers of buttery pastry, filled with sweet blueberries and tangy sweet lemon curd, and topped with a tangy lemon glaze. These lemon blueberry turnovers were SO tasty! They disappeared in no time here. 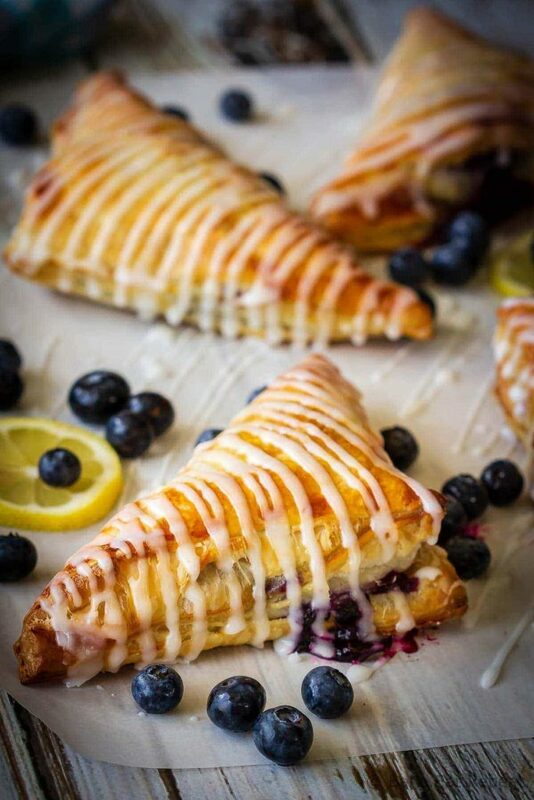 So if you’re looking for a fantastic sweet treat that you can make in minutes – these lemon blueberry turnovers are for you! Make sure your puff pastry is thawed, but cold, when you unroll it and start shaping the turnovers – if it gets too warm it will get very sticky and hard to work with. I recommend forming the turnovers one sheet of pastry at a time, leaving the second one in the fridge until the first four are ready to go in the oven. I used fresh blueberries for the filling, but frozen would work well too. If you mash them up a bit while you’re cooking them on the stove you will get a nicer texture for the blueberry sauce. I used this homemade lemon curd, which can be made in the Instant Pot or on the stovetop and is very easy to make, but you could definitely use some store-bought lemon curd instead if you like. 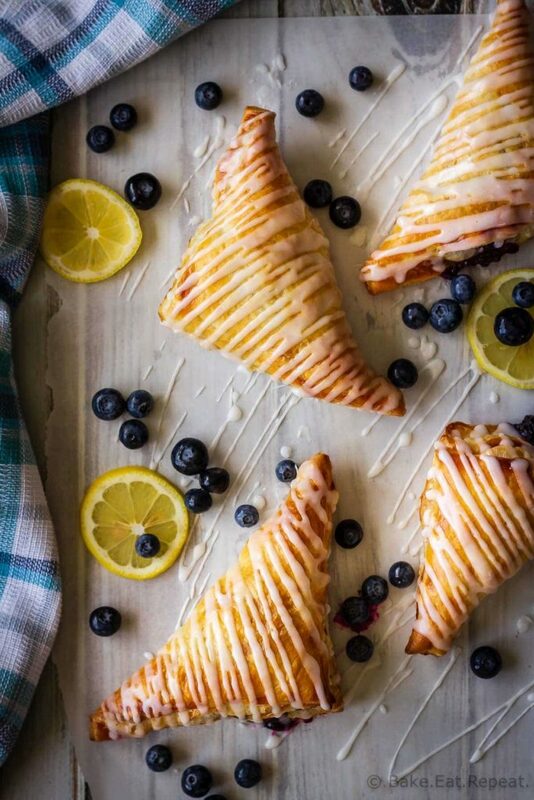 These lemon blueberry turnovers are a fast and easy dessert that everyone will love - the perfect sweet treat for the summer! Preheat the oven to 450 degrees F. Line a rimmed baking sheet with parchment paper and set aside. In a small stovetop pot, stir together the blueberries, sugar and corn starch. Bring to a boil over medium heat, stirring constantly and mashing the berries a bit with a fork. Continue cooking for 1-2 minutes until the blueberry sauce thickens. Remove from the heat and let cool. Unroll the two sheets of puff pastry and cut each sheet into 4 equal squares. In the middle of each square of pastry, place 1 tablespoon of lemon curd. Place 1 1/2 tablespoons of blueberry sauce on top of the lemon curd. Whisk the egg and water together in a small bowl and brush the edges of the pastry squares with the egg wash. Fold the corner of the square of pastry over the filling to make a triangle and press the edges together with your fingers to seal it. Place the turnover on the prepared baking sheet and poke a few holes in the top with a fork to vent it. Brush the tops of the turnovers with the egg wash as well. Bake for 13-15 minutes, or until the turnovers are puffed and golden brown. Let cool. In a small bowl whisk together the powdered sugar and lemon juice and drizzle it over the cooled turnovers. Turnovers are best served the same day. 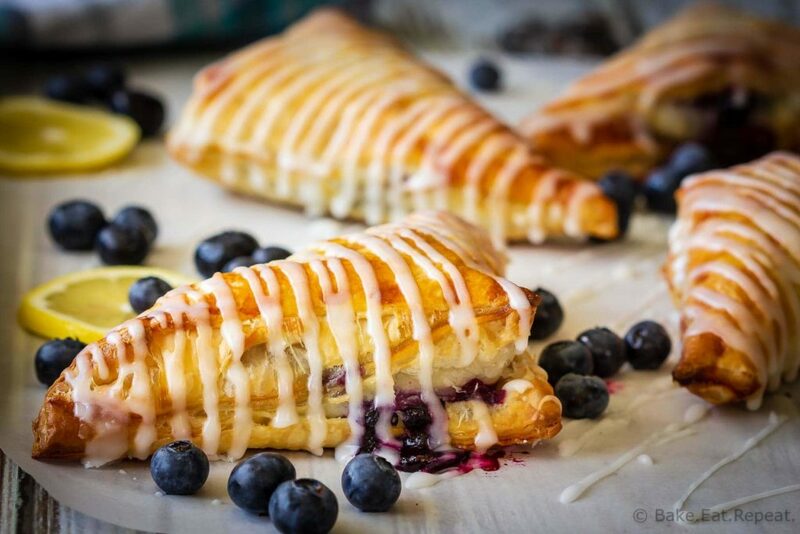 These turnovers are gorgeous! I love the blueberry - lemon curd combination!